I quickly noticed that though not a lot was happening during the first chapters, I was thoroughly enjoying myself. 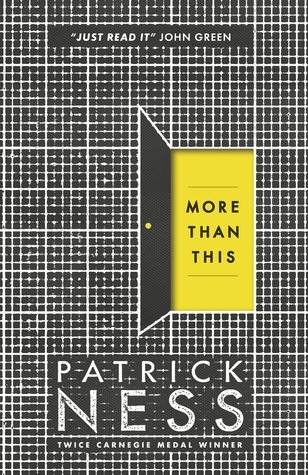 Patrick Ness manages to create a lot of suspense and action even when not a lot is going on. I believe he could let Seth pick his nose for an entire chapter and it would still not be boring. What made More Than This even more compelling were the diverse set of characters that enter the story gradually. Seth’s friendship with them offer a lot of light heartedness to the otherwise grim and dramatic story. On Seth’s journey towards answers, every answer really gave me ten more questions in return. Oh, how many times I was deceived, how many times I thought I knew exactly what was going on and ended up terribly wrong. Many of these questions consider the philosophy of reality. Is the world he woke up in real? Or just some crazy dream? If it is real, what happened to him? Patrick Ness never really offers a clear answer to these questions, except that maybe they’re not worth considering at all, because you may forget to live. The ending feels really anticlimactic compared to the suspense in the rest of the book. There’s a build-up towards something, but really no final answer to the millions of questions left unanswered. I believe they are up to your own interpretation, so if you’re up for that, this might be a five star rating for you. Personally, I needed a little more than this..